Steve Sansweet tweeted along the news from Variety that PT visual effects supervisor John Knoll has joined the Academy of Motion Picture Arts And Sciences’ (the people who put on the Oscars) Science And Technology Council. He was picked along with three other people: Gale Anne Hurd, John Bailey, and Michael Tronick. Congratulations! I’ve never met a John Williams soundtrack I didn’t like and certainly not a Star Wars one I didn’t love. Apparently the world thinks so too, because the ROTS soundtrack not only sold well for a soundtrack that didn’t have a pop song tacked onto it to increase sales and snag a Best Original Song nomination, it also got great reviews and snagged several award nominations, including a Grammy nomination in 2006. 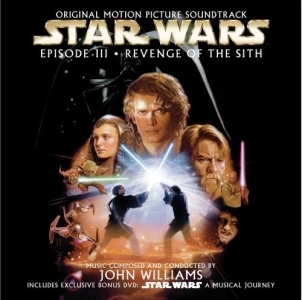 In the UK, “Battle of the Heroes” got to #25 on the singles chart, a chart a million times more competitive and eclectic than the usual Billboard Top 40 or Hot 100 in the U.S..
Also for you trivia buffs, the Star Wars: A Musical Journey extra accessed on DVD players inspired the touring arena show of the same name in 2009-2010. We female Star Wars fans, or fangirls in general, have been on a lucky streak over the past few years as there is a growing amount of girly fan products available to the masses. Someone on my Facebook feed noted that her last trip to Hot Topic was like a mini Comic Con with all of the Doctor Who, Batman, Disney, Harry Potter, Supernatural, etc. merchandise for sale, much of it for the ladies. I even picked up some Nightmare Before Christmas perfume because I had one of those Hot Cash things to use. Her Universe has produced a steady stream of wearables for ladies over the past four years. But recently a thought came to me as I read this post on Set To Stunning. This stuff was available first at Comic Con and I ended up buying the “Galaxy Wars” jacket but as per usual, OT only. Even though everyone is trying to make more fashionable fan gear for fashionable fangirls with varied results, I’m dismayed that these companies are ignoring the fact many of us fangirls want one Star Wars character’s closet, and it’s not Chewbacca’s. Padmé’s fabulous costumes are such a no-brainer as inspiration for fangirl wear. She is easily the most fashionable character in the GFFA. Everybody likes her outfits. Either the people who design these things and sell them don’t really know all of that much about Star Wars or they’re a bunch of PT-haters. Don’t tell me “Padmé is so slender and her costumes aren’t flattering on everyone” either. Look at most of the wares you can buy now: leggings, tight dresses, extremely short skirts. Not exactly the most flattering or inclusive designs as it is. Unfortunately we’re stuck with companies that don’t care about the saga and definitely not about us. 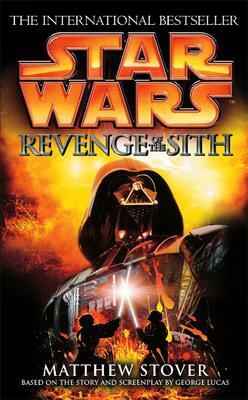 Darth Vader was the motif for ROTS marketing, since after all it’s the prequel film where he appears in his black armored glory. For the ROTS toy line, Hasbro decided to mash (pun intended) up its Mr. Potato Head toy with the galaxy’s second most evil guy and cuteness results. 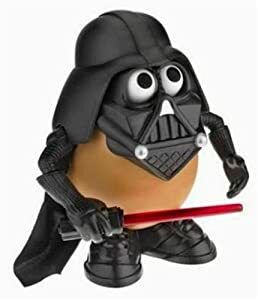 Darth Tater was hugely popular and Hasbro has produced several potato-ized Star Wars characters since, including as Disney park exclusives. ROTS was released at the dawn of what’s become the internet meme. Not only did Darth Vader’s anguished “noooooo” become a meme, so did the hilarious Chinese bootleg of the film, featuring badly-translated captions. “Nooooo” was translated to “do not want” and a popular catchphrase was born. We got to the FIDM early and since there weren’t a lot of people around, they went ahead and let us in. I have to say we all had a much better time at this exhibit. Because the galleries were open and because there weren’t people crowded all over the place, you actually could get a good long look at the costumes. SW music played over the speakers and plasma screen played scenes from the movies in various rooms. The costumes are divided into the OT room, the Jedi, Senators, bad guys, royalty and other good guys, and Padmé’s wardrobe. Artoo and Threepio were on display at the beginning. Some I’d seen before at the Magic of Myth exhibit in 1997-99 and a couple of others were on display at Celebration II, but the rest were new to me. I’d never seen Leia’s snowsuit from TESB before, so seeing it was cool. The show of course focused on Trisha Biggar’s work on the PT and I was just blown away. What beautiful clothes! Even minor characters seen onscreen a few moments had marvellously-detailed costumes. I can tell you the Neimodians are really big in person. I never expected them to be for some reason. Natalie has to be quite tiny…the Amidala throne room costume from TPM looks like it was made for a kid, which she was at the time. But even some of her costumes from AOTC and her Mustafar outfit from ROTS show that she must have a tiny waist and real thin legs. The handmaidens didn’t seem to be much bigger either. Chewbacca is there and so is the ROTS Darth Vader. Girls, you can get up real close and personal to that codpiece! Heh heh. Unfortunately, there are sensors around the open display cases and if you get too close to them, a security guard will yell at you or, like my dad did, set off the sensors. He standing too close to Vader and was pointing at something when they went off. As you would expect there is an entire room of Padmé’s costumes. This was actually my favorite part of the exhibit…gorgeous, gorgeous stuff. The wedding dress took by breath away. Even my mom thought it was fabulous. She also loved the picnic gown. Pretty much all of Padmé’s duds are on display there, including her burial gown from ROTS, complete with a flower filled coffin. It was damn sad looking at it. The mannequin was clutching the japor snippet. Waaah! The coffin looked pink in person, but that could be just the lighting. The flowers inside were silk flowers, which leads me to suspect the ones used in the movie were real. The only costumes of hers not seen at the exhibit are her Naboo battle outfit from TPM (in Paris), her parade gown from TPM (in Paris also), her Tatooine disguise from TPM, and her rainbow dress from AOTC. My only quibble is that they turned the mannequin displaying Padmé’s Naboo nightgown/velvet robe from AOTC to the side, making it really hard to see the nightgown. The only nitpick I caught was the display for the black throne room gown from TPM…it noted that Natalie wore the costume but aside from promo shots, she never did wear the costume in the movie. Keira Knightley did. Oh well. 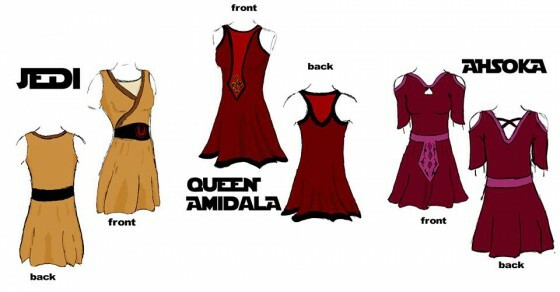 Queen Apailana and Jamillia’s costumes are on display too, by the way. And there’s an area where you can paw some swatches of fabric used for the costumes. There were fans of all ages in attendance but there were also some design students hanging around sketching. One girl was going nuts gushing over the frocks. I don’t know if they were studying how to make costumes for film/stage or if they were studying fashion design but it was cool seeing these costumes inspire people. The gift shop was tiny. It was so small, they had to let in a few people at a time. I bought some stuff for friends and grabbed for myself a souvenir t-shirt ($30, but I’m a sucker), a souvenir magic cube, a magnet of Anakin looking angsty and wicked with the black eyeliner, an Anakin ROTS Bust-Up, and a set of oversized postcards. The postcards are very slick. Unfortunately, since my digital camera has an automatic flash and flash photography wasn’t permitted, I didn’t take any pictures. My dad though got a couple of shots off of his cell phone. We’ll see if they turn out! In a nutshell, if you can come to L.A. to see this exhibit between now and early December, do it! It’s only five bucks to get in and you’ll be able to geek out all you want. Just don’t set off those sensors. 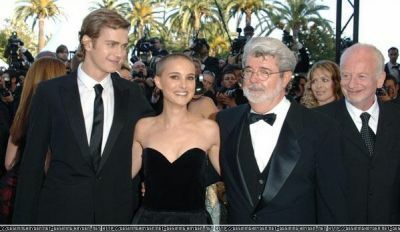 By the time ROTS was released, George Lucas wanted to make sure costume designer Tricia Biggar got some recognition because the the trophy people sure weren’t going to give it (she had been nominated for the Saturns but didn’t win). So in 2005, Lucasfilm and Los Angeles’s FIDM (fashion school) teamed up to put on an exhibit of Star Wars costumes, including a big chunk of Biggar’s work for the prequels. It was a great show and I’m very glad I went to see it. That fall, Lucas had also put on a fashion show of models in Biggar’s costumes to coincide with New York’s Fashion Week. Matthew Stover’s ROTS novelization spent 10 weeks in the top 10 on the New York Times’s bestseller list for hardcover fiction, peaking at #3.